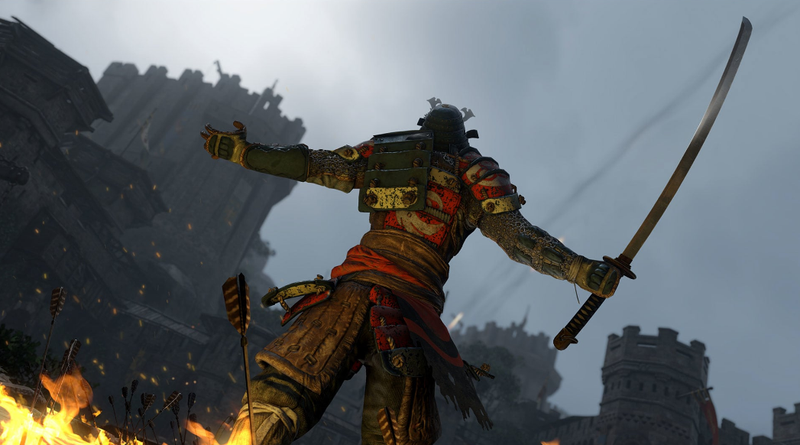 For Honor is a satisfying, layered fighting game that relies on “feel.” You’re fundamentally not going to get good at it unless you successfully program reactions to quick animation cues into your fingers. Without practicing the basics, you’ll be blocking and dodging like an idiot, totally unprepared for whatever this game’s meta will become. Developing fighting game impulses is something obvious that, often, a tutorial leaves you figure out on your own. 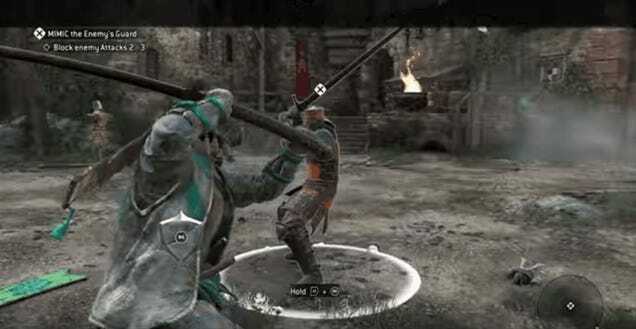 For Honor’s tutorial is a relaxed, but firm reminder that, like any fighting game, it will take discipline to really master. For those intimidated by a game that has the potential to be everything bad about RPG combat, you should know that the tutorial is refreshingly thorough. You’ll leave it with exactly enough confidence to spar with a stranger who will inevitably kill you five times. To defeat that stranger, you’ll have to seriously focus on the combat system’s building blocks which, in the next few days, players will expand on very quickly. I haven’t played a good tutorial in memory. Recently, I picked up Bloodborne, and became so frustrated by its “Run around and collect notes in this little garden” intro that I completely neglected to follow its instructions. That’s the risk of a bad tutorial—it’s so slow, boring and unnecessary that you spend the rest of the game crippled, but too stubborn to return to it. Worse are tutorials that launch players into a dramatic scenario, expecting them to pick up skills in the midst of a sudden emotional moment. For Honor’s tutorial avoided all of that. I started with the Samurai class, the Kensai. You’re in a castle training ground, a little King’s Landing-esque. There are two dummies in front of you, and although the area isn’t small, there isn’t much else to do other than approach them. The game prompts you to lock onto the targets, switching back and forth between the two. You learn to guard and block from the left and right and air before a soldier enters from a back door. He approaches and you practice on him, eventually adding light and heavy attacks to your repertoire before defeating him. It seems like a bread-and-butter tutorial, but a few things really struck me. First, it didn’t feel overwhelming. I could focus on one thing at a time, unafraid that I was dipping my toe into a deep, dark sea of combat mechanics (even though I was). I was prompted to practice each thing two or three times, from each side, before progressing. That’s good, because I’ll often skip through these sorts of repetitions at the expense of sewing them into my reflexes. With fighting games, knowing how to do something is a poor substitute for having the impulse to do it. Also, after you fulfill each task, you can practice as long as you’d like before moving on. Sonic and directional clues from the AI forced me to think about timing. Before he swings from the right, you’re prompted to block to the right with an arrow and a grunt as he lifts up his sword. Soon, the blocking becomes mechanical. Against a player, those cues are much softer, and I personally can have trouble pairing slight animation cues with controller actions when I’m picking up a new fighting game. So although it felt a little hand-holdy, it’s exactly what I needed. After you defeat the soldier, you’re told to capture Zone A, which prepares you for the multiplayer ame at larger. You’re not immediately bombarded with enemies. You’re not let loose into a terrifying open world. You run through a somewhat linear path until you encounter some bad guys, which you promptly crush with your new skillset. A swarm of enemies attacks and with total ease, they’re destroyed. It was a little Dynasty Warriors, but the low-key challenge was gracefully switching targets in between small and hard sword slashes. At this point, you’re cruisin’ and feeling great about yourself. 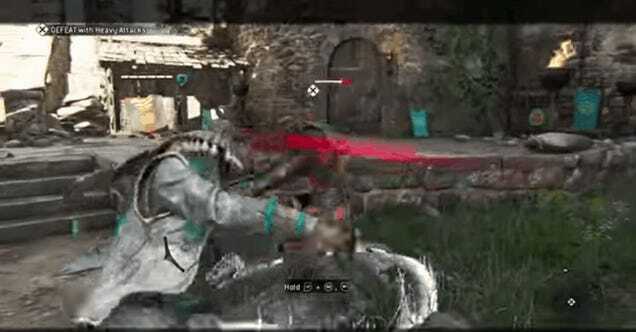 Before you’re feeling too confident, For Honor introduces a few more mechanics: dodging and guard-breaking, both of which appear quite simple in this happy little void. Then, you’re told you’ve captured the objective. I really dug the pacing of this. You start out on dummies and move to an easy AI, several very easy AIs and, finally, a moderate AI. The relative simplicity focuses you on skill-building, never really indicating how difficult it will be once you’re up against another human. And honestly, that’s a good thing. Already, players are getting very good. And to defeat them, you’re given a not-overwhelming skillset to master in a safe, small and finite zone. Fighting games are a war of confidence, and sometimes, of false confidence. Feeling good about the basics will get you into the right mindset to grind on the more advanced techniques. You might get discouraged facing off against other humans because the skill difference is so jarring, but on the bright side, For Honor is telling you that, right now, mastering the easy stuff is your path to success.